Trump spoke before a massive crowd on behalf of his former foe, who faces a strong challenge from Democratic Rep. Beto O’Rourke. When the two competed in the 2016 Republican presidential primary, Trump would frequently deride his rival as “Lyin’ Ted” but said in Texas that their relationship had come a long way. With the midterms drawing near, Trump has emphasized immigration, targeting a migrant caravan heading to the U.S. southern border. The president’s focus on immigration politics comes as he seeks to counter Democratic enthusiasm in November. Trump believes that his campaign pledges, including his much vaunted — and still-unfulfilled — promise to quickly build a U.S.-Mexico border wall, are still rallying cries. Trump is betting that his latest focus will further erode the enthusiasm gap that began to close during the debate over Brett Kavanaugh, Trump’s nominee for the Supreme Court. But the approach offers both risks and rewards. The hard-line rhetoric may be popular among the red-state rural Republicans who will play an outsized role in the top Senate contests. But it may further alienate the moderate Republicans and women in the overwhelmingly suburban races that will decide the House majority — including several in Texas, California and Florida that feature large Hispanic populations. Earlier Monday, Trump said the U.S. will begin “cutting off, or substantially reducing” aid to three Central American nations because of the caravan. Trump gleefully used his latest attack line against Democrats, saying, “Democrats produce mobs, Republicans produce jobs.” He declared Democrats would be a “big risk to the American family,” and went after some of his favorite targets, including Democratic House Minority Leader Nancy Pelosi, California Rep. Maxine Waters, New Jersey Sen. Cory Booker and Massachusetts Sen. Elizabeth Warren. 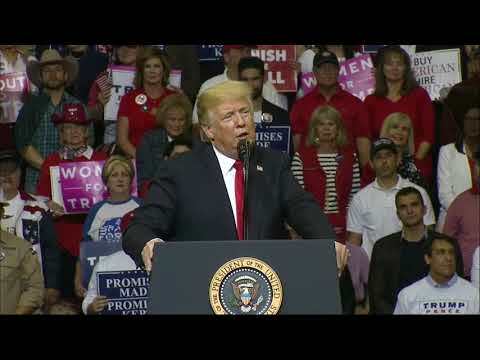 The president stressed tax cuts, the strong economy and the hurricane response in the state. He repeated his pledge for a new middle-income tax cut of about 10 percent, though he offered few details on the plan. Trump said they would be “putting it in” next week, though Congress is not in session. Cruz gave back as good as he got in 2016. He savaged Trump as a “pathological liar,” an “amoral bully” and a “sniveling coward.” After Cruz lost the primary, he gave a speech at the Republican National Convention in which he did not endorse Trump and instead called on Republicans to “vote your conscience,” drawing boos from the crowd. But he announced his support about a month before Election Day — and won points in Trump’s camp for not withdrawing after the “Access Hollywood” tape was released in which Trump bragged about groping women. Associated Press writer Steve Peoples contributed to this report from New York.